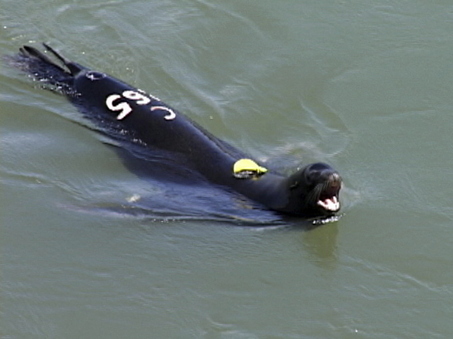 The sea lion had no name, although he did have a designation: C265. He was the first to die but not the last. As of this writing, the state of Oregon has killed seven sea lions and has permission from the federal government to kill up to 60 or so more. You know, I have to admit, I generally prefer sea lions to most Americans. For one thing, sea lions don't talk about how much they'd love to shoot the heads off fishermen like most commercial fishermen do about sea lions (and seals). Sea lions also don't actually shoot the heads off fishermen, while some fishermen really do shoot the heads off sea lions -- and I would know because I used to regularly encounter sea lions (and seals) on Nestucca Spit with most of their faces sheared away by bullets. How do I know fishermen shot them? I overheard them brag about it in their bars and read the bumper stickers on their boats and trucks. It's not really a big secret if you live on the Oregon coast and listen where alcohol flows. My preference for sea lions began as an adult. I never saw them growing up in Oregon in the 1970s because a state-financed bounty program from the previous decades nearly wiped them out. If not for the passage of the Marine Mammal Protection Act in 1972 and the Endangered Species Act in 1973, there wouldn't be one California sea lion left alive in the Columbia River, off Oregon's coast or entertaining tourists on Newport's bayfront. But Congress passed the laws, and the numbers of all pinnipeds rebounded within three decades, but nowhere near the level before white settlement, a fact conveniently forgotten by those who believe that salmon and sea lions somehow evolved separately from one another and didn't co-exist in perfect ecological harmony until Americans came along to detonate the harmony. Might I also add that I prefer sea lions because they don't kill each other over religion, torture, experiment on primates, snort methamphetamine, elect county commissioners who don't understand basic ecology, beat their children, pontificate about simple-minded notions like "private property rights," destroy ecosystems -- nor perpetrate a massive ecological fraud such as hatchery-raised salmon, which continues masking the fact that wild salmonids in the Columbia River basin are nearly extinct. Sea lions are smart too, maybe smarter than the average Oregonian or environmental reporter or columnist from The Oregonian, none of whom seem to know that 80 to 90 percent of all salmon in the Columbia originate from hatcheries. These humans also don't seem to know that biologists estimate sea lions eat between 0.4 and 4.2 percent of the annual spring Chinook run, or that of that infinitesimal number, the vast majority are hatchery-raised fish. And for that, fishermen lobbied to have sea lions killed. They succeeded, and now the official killing has begun, and the unofficial killing will intensify. It's all totally insane, and Oregon's politicians drank the fishermen's Kool-Aid and sucked it down good. Dams, logging, grazing, mining, overfishing, development, pollution and dredging killed off the wild salmon, but sea lions get murdered for it. If there is a better case study documenting historical and ecological delusion, a pathological hatred of humans toward another animal species, and an example of this country denying responsibility for destroying nature, I cannot think of it. Just read the comments posted about this piece, and you can see for yourself. Matt Love lives at the Oregon coast.